BACKGROUND: Many clinical treatments have been attempted for weight reduction in overweight patients, body mass index (BMI) below 30, most commonly medically treated with Orlistat, Sibutramine and more recently with Rimonabant, all presenting gastrointestinal, circulatory, metabolic or psychological side effects which are sometimes severe. 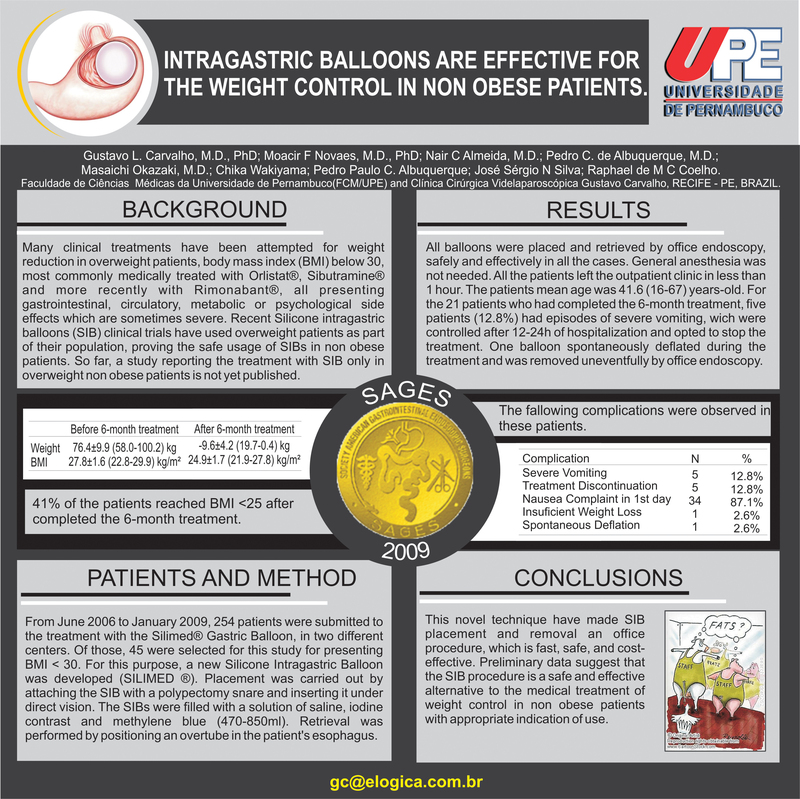 Recent Silicone intragastric balloons (SIB) clinical trials have used overweight patients as part of their population, proving the safe usage of SIBs in non obese patients. So far, a study reporting the treatment with SIB only in overweight non obese patients is not yet published. OBJECTIVE: To present the SIB treatment results in overweight patients. METHOD: From June 2006 to May 2008, 223 patients were submitted to the treatment with the Silimed® Gastric Balloon, in two different centers. Of those, 39 were selected for this study for presenting BMI < 30. RESULTS: All balloons were placed and retrieved by office endoscopy, safely and effectively in all the cases. General anesthesia was not needed. All the patients left the outpatient clinic in less than 1 hour. The patients mean age was 41.6 (16-67) years-old, initial weights and BMI were 76.4±9.9 (58.0-100.2) kg and 27.8±1.6 (22.8-29.9) kg /m². For the 21 patients who had completed the 6-month treatment, the results in weight loss and final BMI were 9.6±4.2 (19.7-0.4) kg and 24.9±1.7 (21.9-27.8) kg /m². Five patients (12.8%) had episodes of severe vomiting and opted to stop the treatment. One patient (2.6%) had insufficient weight loss. 58.9% of the patients complained of nausea in the first days of treatment. One balloon spontaneously deflated during the treatment and was removed uneventfully by office endoscopy. CONCLUSIONS: Preliminary data suggest that the SIB procedure is a safe and effective alternative to the medical treatment of weight control in non obese patients with appropriate indication of use.